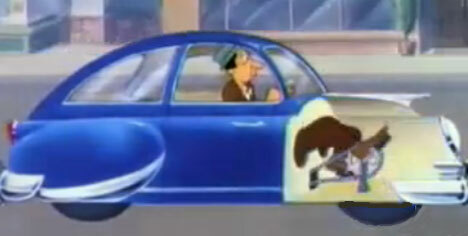 The incomparable cartoonist Tex Avery had a knack for making totally goofy predictions about future technology. His series of “… of Tomorrow” cartoons took some animated guesses at what life would be like in the future. The two below were produced in the early 1950s for MGM. They’re full of goofiness, fun futurism…and a bit of old-fashioned sexism. These tongue-in-cheek predictions were never meant to be serious forecasts of actual cars that would one day rule the road – but at least one of them (accidentally) came close to the truth. The foot-propelled car isn’t far off from energy-saving people-powered vehicles being designed today in the interest of minimizing fossil fuel consumption. The “TV of Tomorrow” short, however, came a little closer to predicting the actual state of present-day television. There’s no more need for antennae or exhaustive tuning, and it seems that every channel plays the same show or two at all times. You can view “peep shows” from home and even place bets on the outcome of certain shows. DVRs can help you skip right through commercials, and even the TV-based fishing game has been made into reality more than once. The future is an awesome place to live. See more in Retrofuturistic or under Vintage & Retro. February, 2011.